The Spring Fling Courthouse Show is now SOLD OUT! We would like to thank Dart Container of Michigan for being our presenting sponsor! 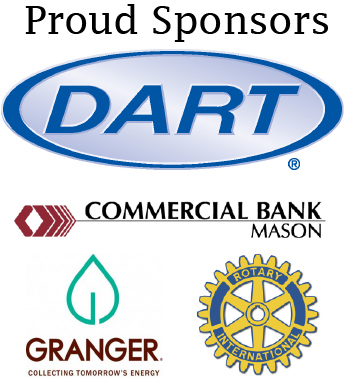 We would also like to thank Granger for being our environmental sponsor, Commercial Bank Mason for being our entertainment sponsor, and Rotary Club of Mason for sponsoring Kids Korral! No electricity, tables or canopies are provided, only the 10X10 area for the day. Vendors are required to setup 18 inches from the sidewalks to avoid sprinkler lines. Free parking is available in the designated municipal lots. NO parking all day in the two-hour spaces! 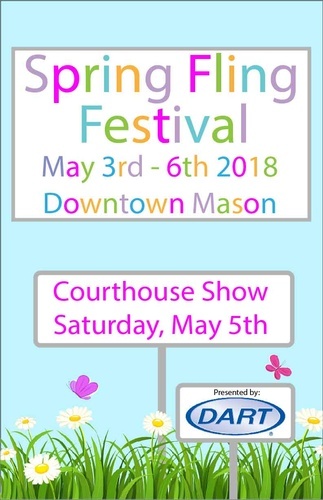 Registrations for the Spring Fling Courthouse Show will close Thursday, May 3rd at 3pm unless the show sells out before hand. 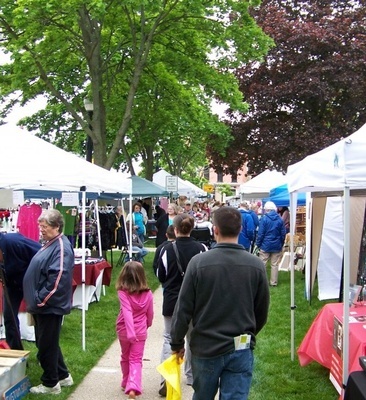 Any vendor with a canopy larger than 10x10 will need to obtain a building permit from the city of Mason. Two 10x10 canopies placed next to each other do not require a building permit. Please direct all questions to the City of Mason, 517-676-9155. A SEPARATE FOOD VENDOR APPLICATION IS REQUIRED. SPACE IS VERY LIMITED. PLEASE CONTACT US. Food vendors will be provided with electricity only. Power is available at 15amp 110v and 30amp 220v. Please contact the chamber with specific electricity needs. Water hook up will not be provided please bring your own water supply. Food vendor applications close one month prior to the event.